It was an exhilarating and exhausting week. It started on Thursday and never let up until Sunday evening. And then there was more. 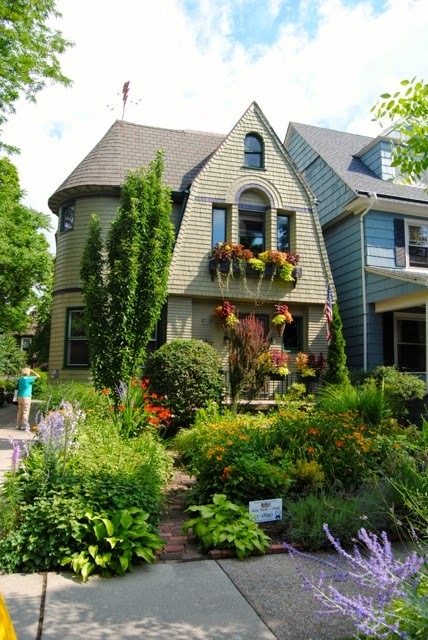 Thursday saw Open Gardens, the National Garden Festival's Thursday and Friday free open gardens throughout Buffalo Niagara - 90+ gardens open for free! 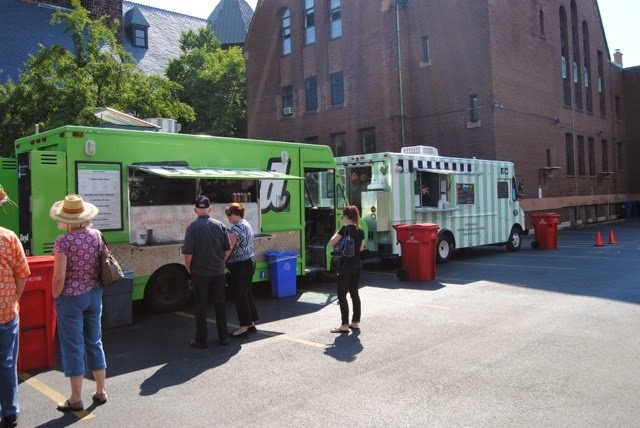 Mine was one of them – from 2-6 p.m. We did get pretty good traffic through - around three dozen each time we were open on a Thursday. Last year, we may have had two dozen for the entire month of July! It helps to have "Mary's Garden" on my street. That's a garden worth traveling for. Also on Thursday, the judges from Italian Marble and Granite came through to judge the scrap marble and granite "carpet" I made - more on that shortly. 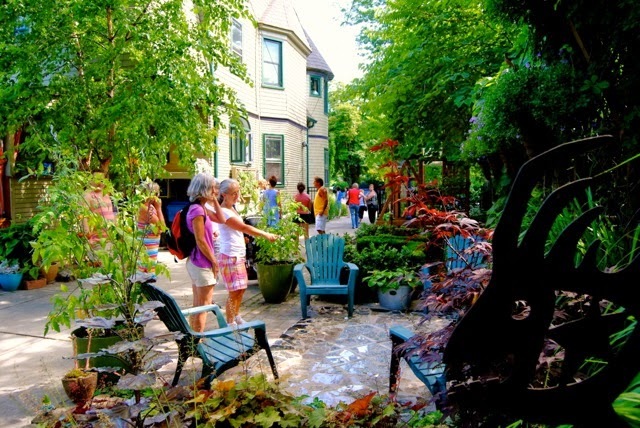 Also on Thursday, around 6:30 p.m. Sally Cunningham, leading one of her AAA/Horizon Club Tours, stopped by on her "Heart of Garden Walk Tour." It was16 tourists, for the better part of an hour, in the garden for a light dinner catered by the Lexington Coop, which is across the street from my house. This granite and marble scrap "carpet"
granite project in my home! Friday was a day of little (paid) work. I hope no clients read this! But it was loading up the car, and then delivering, signs, maps, easels, magazines, books, and more to each of the three Garden Walk Buffalo headquarters. I also helped unload at the different HQs where I could. There was plenty of t-shirts, posters, caps, magnets, cash registers, office supplies and more that it takes to set up three temporary "gift shops" that exist for two days only. There were volunteers, mostly the people that run each HQ, to help – they have a very demanding two days of work and one day of set-up each year. 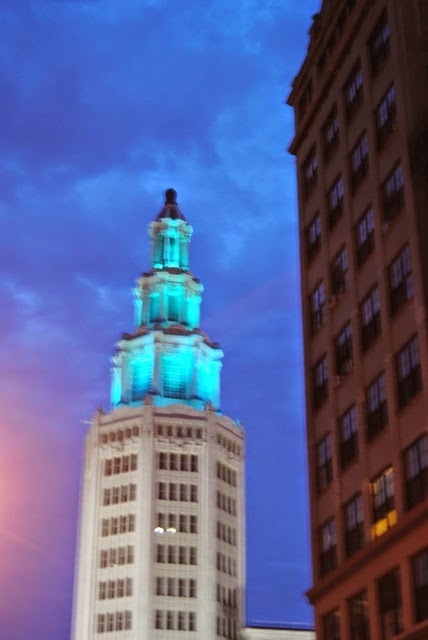 We could use your help with the HQs - let us know at GardenWalkBuffalo@yahoo.com. And while setting up, I was informed that I did win Italian Marble and Granite's "First Place" for my scrap marble project! 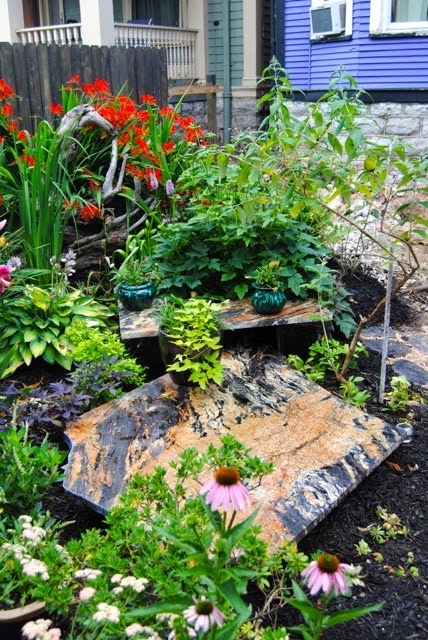 They offered, to all Garden Walk Buffalo gardeners, free scrap marble and granite pieces from their dumpster from their showroom out in Clarence Center, NY. NOT near my house. They offered the free scraps to anyone that wanted to do a project in their garden. About a dozen gardeners took them up on it. A few had projects that were unfinished, and there were three or four that were seriously considered – and I won! The prize? A $500 gift certificate to use on a granite or marble project in my home (or garden I suppose!). My wife and I have to think about this. We'll come up with something! 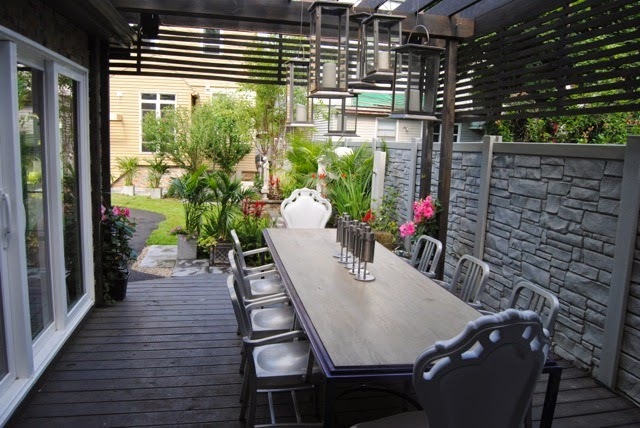 And then, as soon as the owner of Italian Marble and Granite left, we had eight guests for dinner on the deck, partying until late in the evening. so that on Sunday we did five buses in a half hour. Up early (for me) to clean up the driveway. (The neighbor's trees drop so much crud over night!) 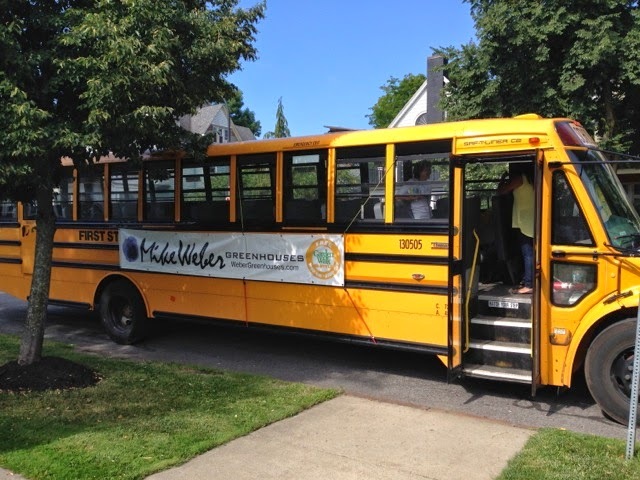 Then on to Kleinhan's Music Hall to put the sponsor banners on the buses with three other dedicated volunteers. Then I went to visit a couple gardens I'd either not seen in years, or had never been. 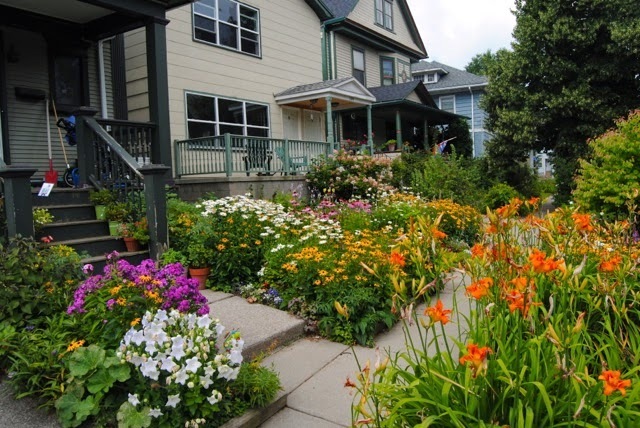 After having been involved with Garden Walk for about 18 years, I still get surprised by the occasional garden I've never been in, as was the case with the Norwood Avenue garden of a new Garden Walk Buffalo sponsor, the new garden store, Sprout. Then it was home to receive the madding crowds. It was a whirlwind of friends and strangers asking basically the same few questions. Next year, I swear, I will do museum-like interpretive signage that may relieve much of the repetition. Oh, and in the middle of it, these two popular vloggers stopped by and filmed this garden video of beginner's garden tips for their large YouTube following. Also, a garden and travel writer couple from Canada stopped in, as well as a scout from Better Homes & Gardens, and also some garden blogger friends from Canada that came here in 2010 for the Buffalo Garden Blogger meet-up. Did I said it was a whirlwind? After we closed the garden, around 4:30, Garden Fairy friends from Florida stopped by for a quick visit. 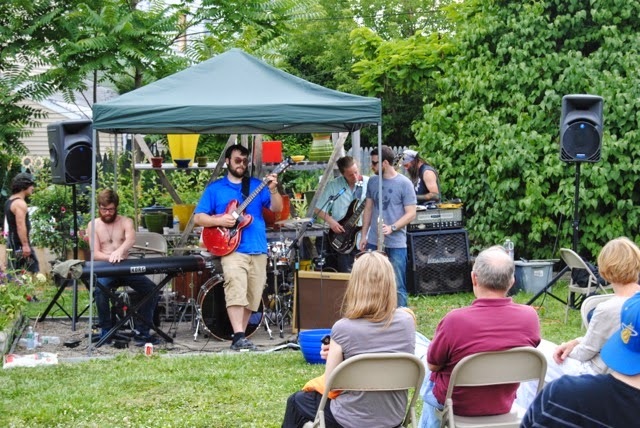 Then it was off to Urban Roots Garden Center, to see how their afternoon of bands and garden art sales went. 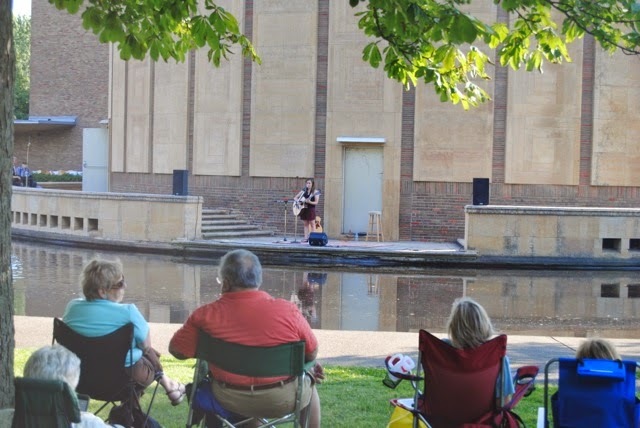 Immediately after that, It was up to the Fredrick Law Olmsted-designed Symphony Circle and Kleinhans Music Hall for the Buffalo Philharmonic's Garden Walk FolkFest – a first time effort to attract the Garden Walk crowds. It was VERY nicely done, with the performers across the reflecting pool and sound that was almost as impeccable as the near-perfect acoustics inside the Music Hall. The exterior of the Eliel and Eero Saarinen-designed building made a great backdrop for the performers, of which there were three. The crowd was thin when I got there considering the size of the space – 75-80 people, but I was told that right at 4 p.m., when it first started, it was around 300 people. I had planned on having dinner there and eating it listening to the folk performers, but all the food trucks that had planned to be there until dusk had run out of food and left. Next, at 7 p.m., it was a walk across the street to the E.B. 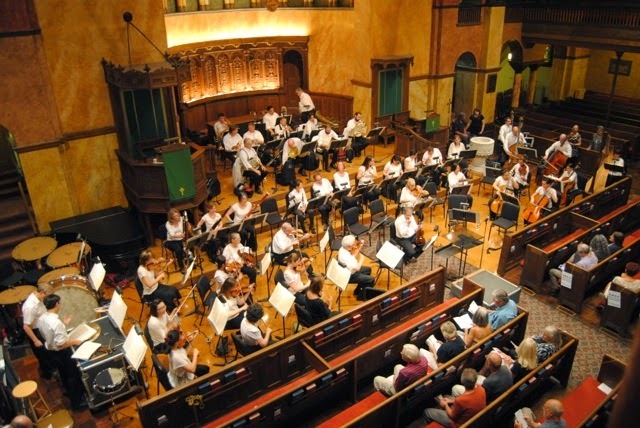 Green-designed First Presbyterian Church for the Buffalo Philharmonic Orchestra's Garden Walk Buffalo 20th Anniversary Concert. Every garden tour should have an orchestra! I was fortunate enough to sit in the third pew - and I would say that the concert was immersive. The musicians were sitting basically a table's length away and the sound in the church was incredible. I was so close to the conductor, that if he fell of his small podium, I'd have been able to catch him. The pieces played by the Grammy-winning orchestra were inspired by nature, or were of a celebratory nature – Rossini's Barber of Seville Overture, The Flight of the Bumblebee, Tchaikovsky's Waltz of the Flowers (nice to hear it NOT at Christmastime), Elgar's Pomp and Circumstance, Smetana's The Moldau, Staruss' On the Beautiful Danube, and Tchaikovsky's 1812 Overture. 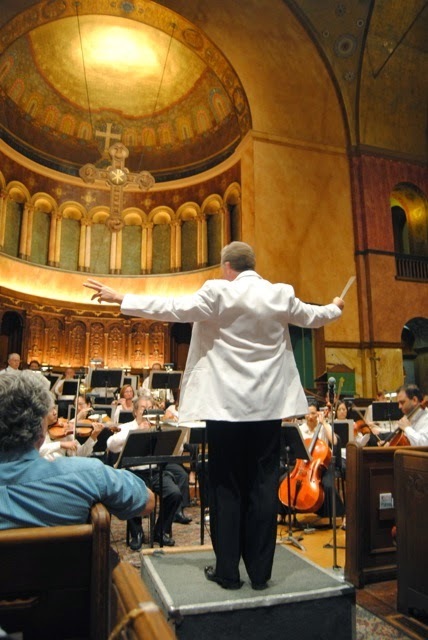 And of course, no summer philharmonic concert can take place without a rousing version of Sousa's The Stars and Stripes Forever, which had the crowd in the church on their feet. lit green for Garden Walk. And then after all THAT, I headed out to take photos of some of the 14 area landmarks that had lit themselves green for Garden Walk's 2oth anniversary weekend. Up early again to help put the sponsor banners on the buses again. Then off to visit a few gardens I'd never been to. Then back home to spend time with approximately 3,000 of the weekend's visitors in the garden. After that it was dinner at the Left Bank with the charming hosta book author Kathy Guest Shadrack and that guy that follows her around, author Mike Shadrack, as well as visitors from out of town. Then a last and final garden party. 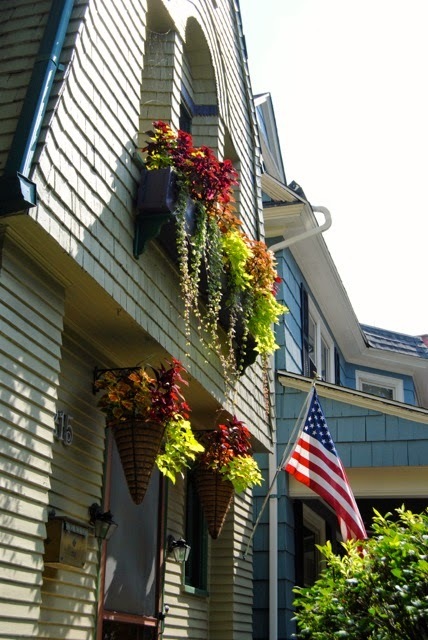 neighborhood is a botanical delight. 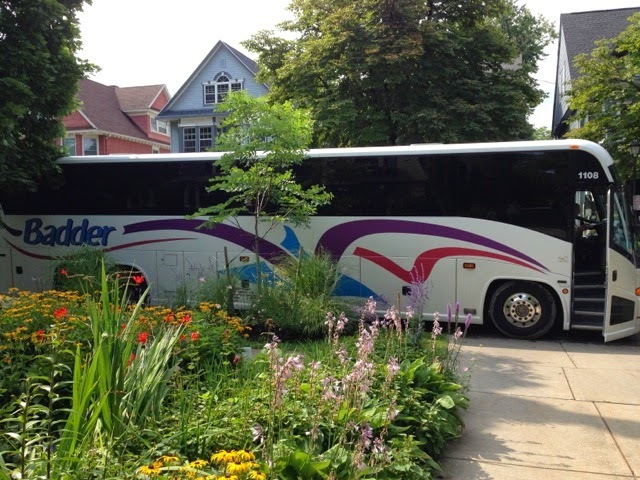 It continued on to Thursday with a bus tour from Canada and 50 friendly gardeners stopping by my garden for coffee and sweets. 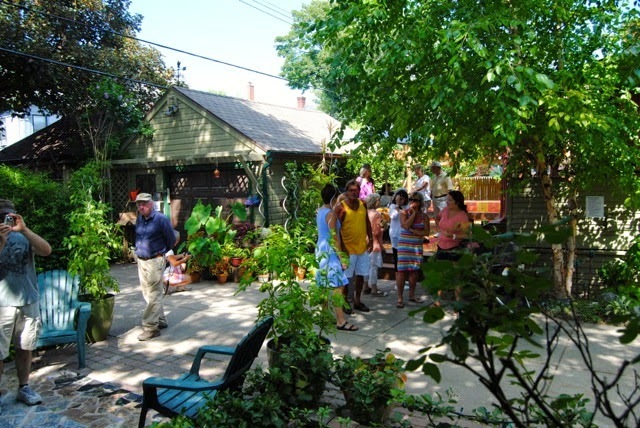 Then it was Open Gardens again from 2-6pm. 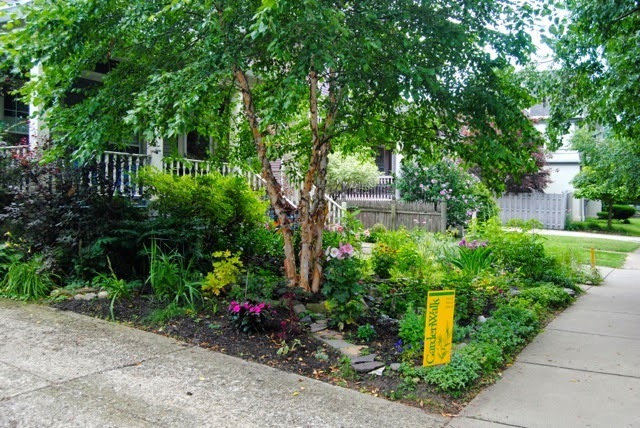 And then, after that, I ran over to the Parkside neighborhood to photograph a couple gardens of friends that I never got to for Open Gardens because their gardens are open the same time mine was. A couple realizations this past week. 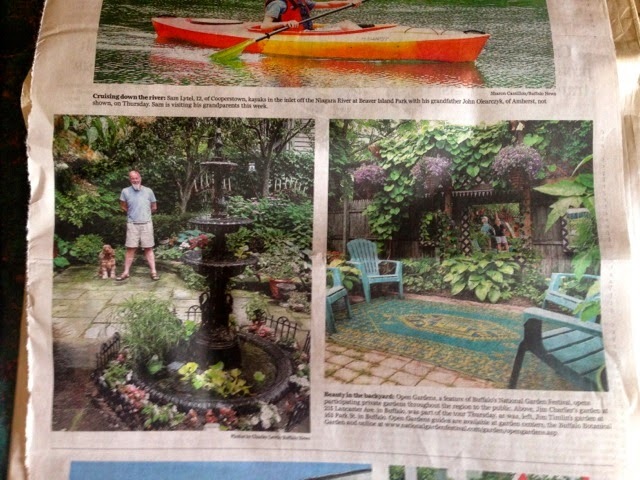 One, my garden has, along with quite a few others in Buffalo, become a genuine tourist destination. Two, I need more interpretive signage. Three, I really like to show off my garden. 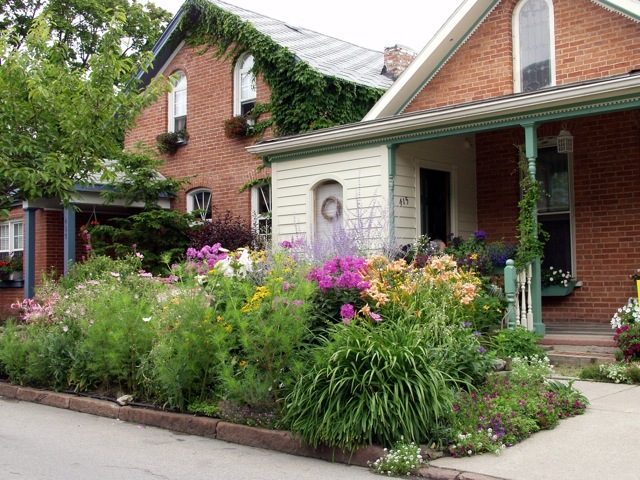 Four, I really enjoy showing off how lovely Buffalo, its gardens and its gardeners are. The garden had people in it constantly. Sometimes it was even crowded. We guestimate, based on past years, it was around 3,000 for the entire weekend. 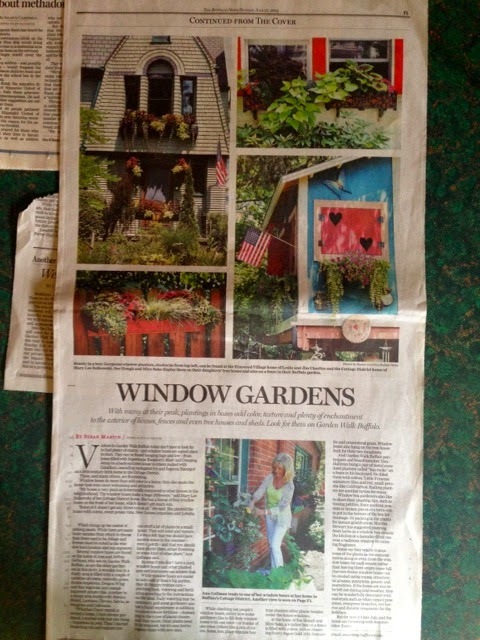 Upper left corner – our window boxes made the Buffalo News' article on window boxes. 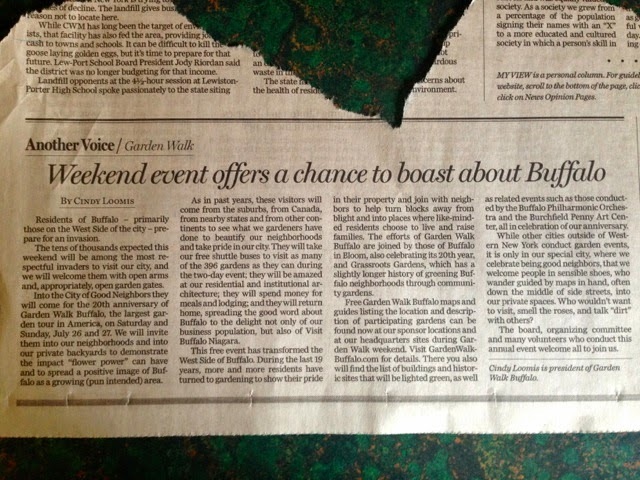 Press coverage was great this year in the Buffalo News. My garden got covered a lot because it's got its own press agent. Me. 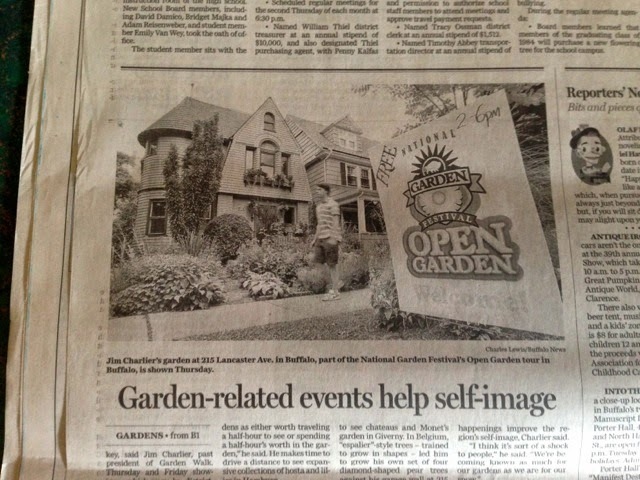 Garden Walk president Cindy Loomis also had an article in the paper this past week. Another marble and granite scrap project on Richmond Avenue. Baskets and cones pulled their weight this summer. helped delay things so that more was in bloom this year. 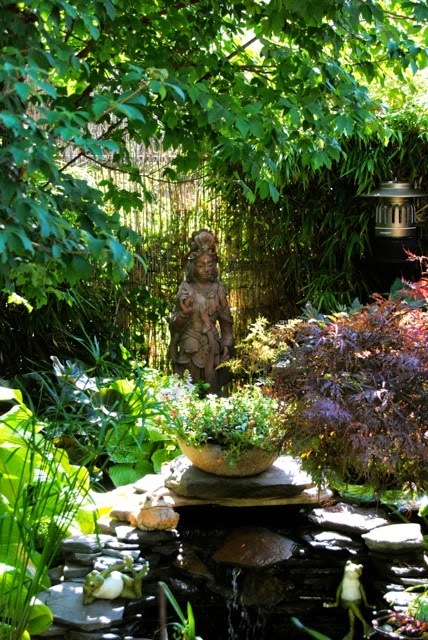 Another typical GW garden I had the chance to photograph. And another couple GW gardens. 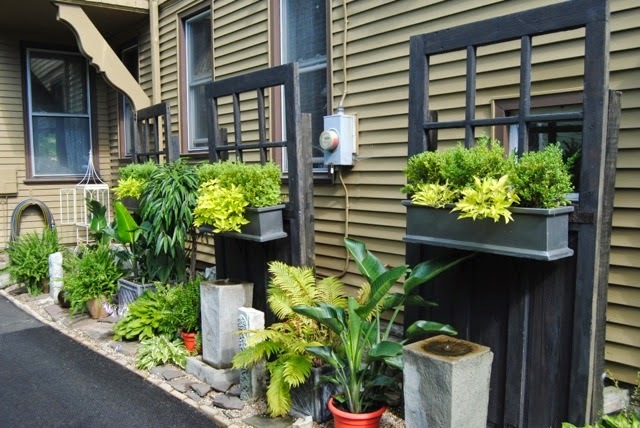 I love it when neighbors garden separately together. 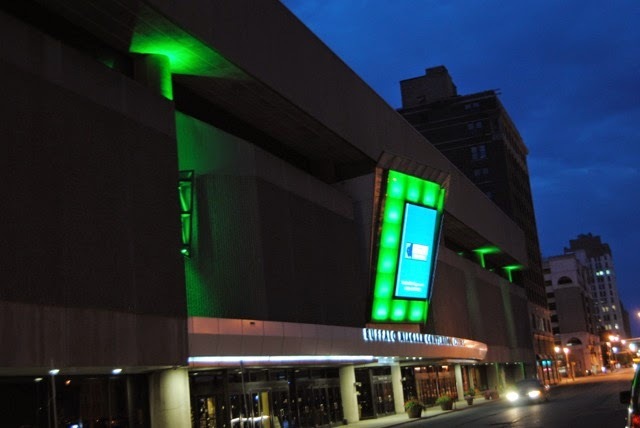 The Buffalo Convention Center was green for GW. 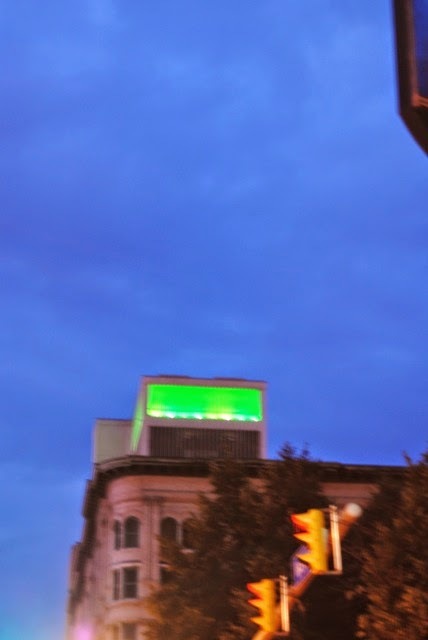 Bad photo, but M&T Tower went green for GW. Seen here over the Hotel Lafayette. 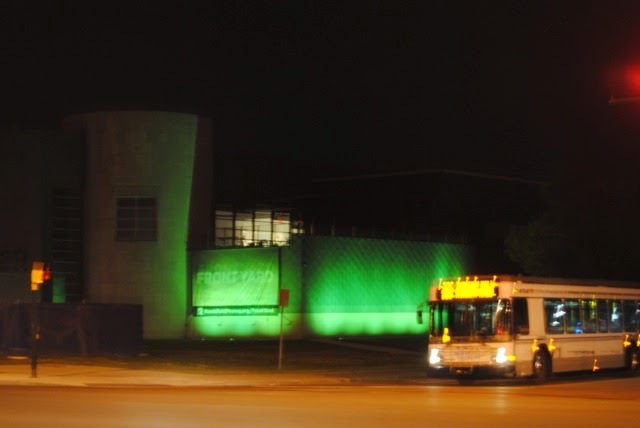 Another bad photo - but the Burchfield Penney Art Center went green for GW. 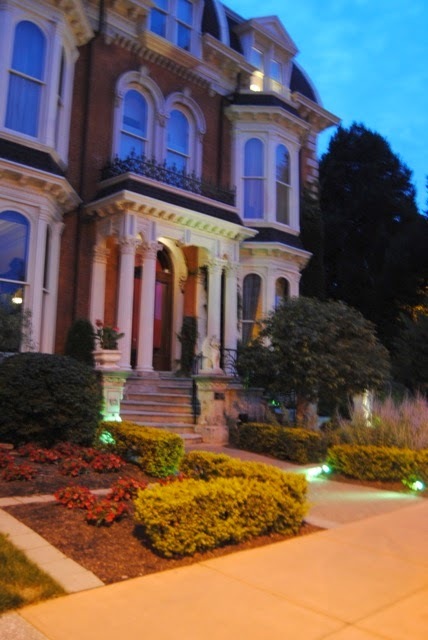 A little bit too early to notice it well, but the Mansion on Delaware avenue went green for GW. 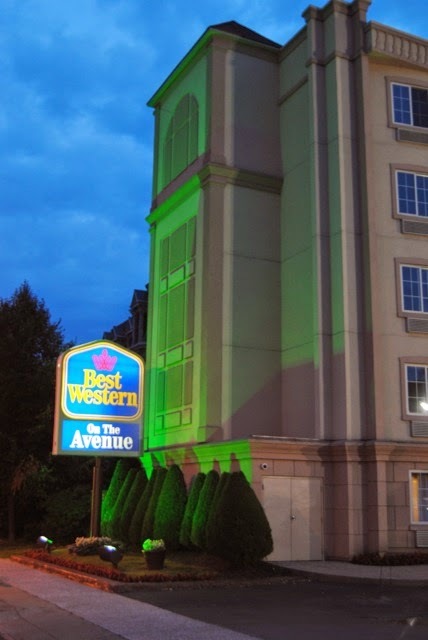 The Best Western on the Avenue went green for GW. The BPO Nation Garden Walk FolkFest had an idyllic setting. 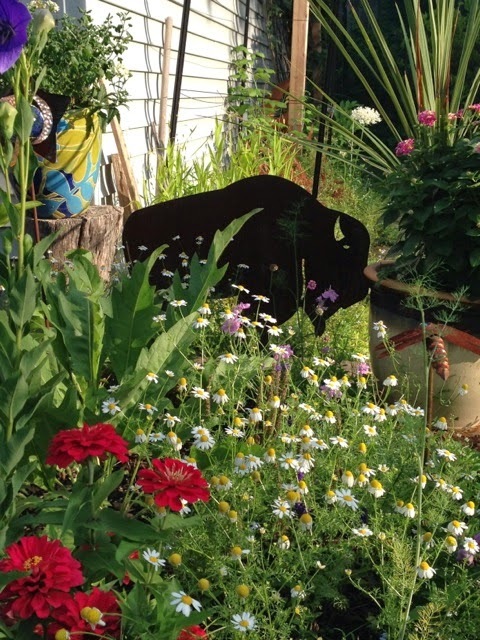 Buffy, the Citybration buffalo, made it out to Garden Walk. At Urban Roots Garden Center is where the two festivals that weekend clashed - there were bands there from Buffalo's Infringement Festival, as well as garden art displays and booths. 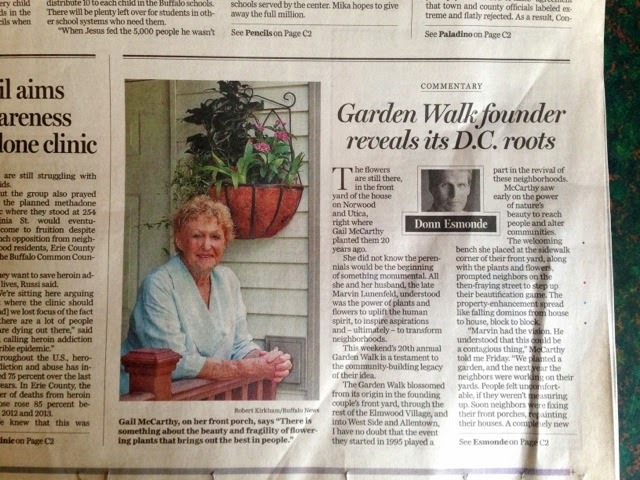 I got to long-time GW volunteer Nancy's garden for the first time in years. 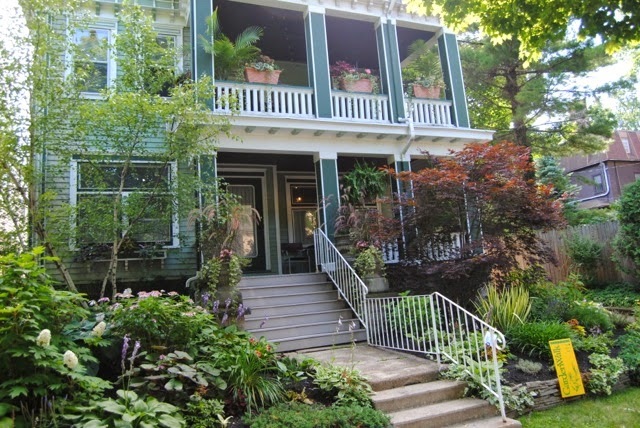 Got to another garden on Norwood Avenue that was a revelation. I'll post more on it later. Same Norwood garden as above. 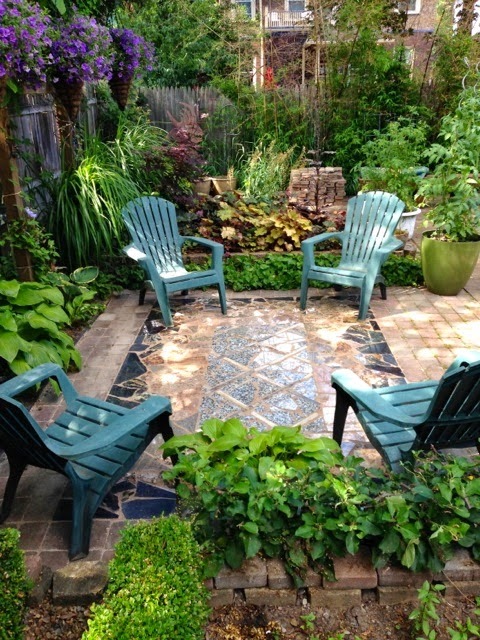 The garden is owned by GW sponsor room/sprout, a home furnishings and garden store on Hertel Avenue. 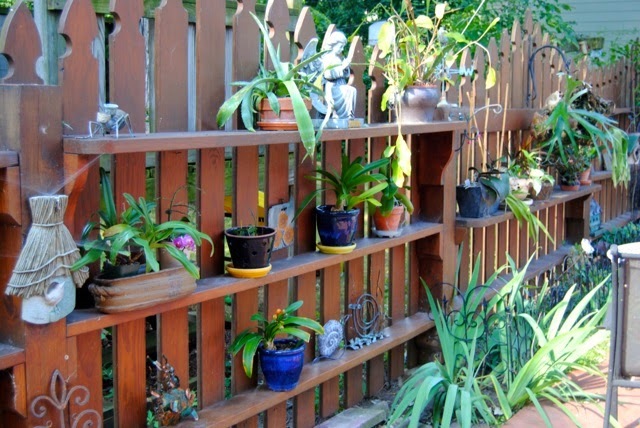 You can tell they use their excellent eye for store display merchandising design in the garden! You were on the go non-stop, Jim. Great fun though. Your garden was always a destination for as long as I can remember. It and you deserve all the press you both can muster. Your granite rug is gorgeous and that was a deserving win too, congrats. 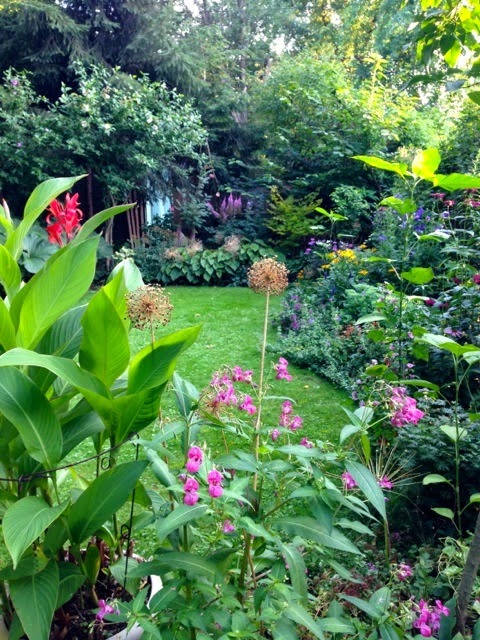 Good to see so much of your garden, both on the blog and when I was there. So many ideas for folks. Thanks for your kind words. Glad you were able to stop by. I'm missing the crowds! the scale GWB has grown to is just amazing, esp. the linked events. 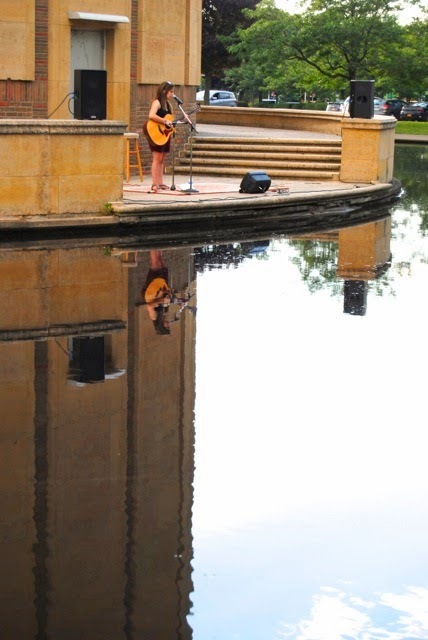 A concert by the reflecting pool at the Music Hall — wonderful! My high school and college both held their graduations there, plus I saw some great concerts. 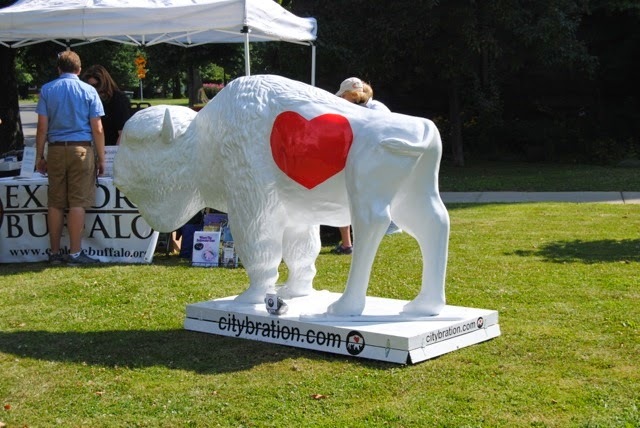 Looking forward to more about the Buffalo event. Good to hear from you Ms. Wis! 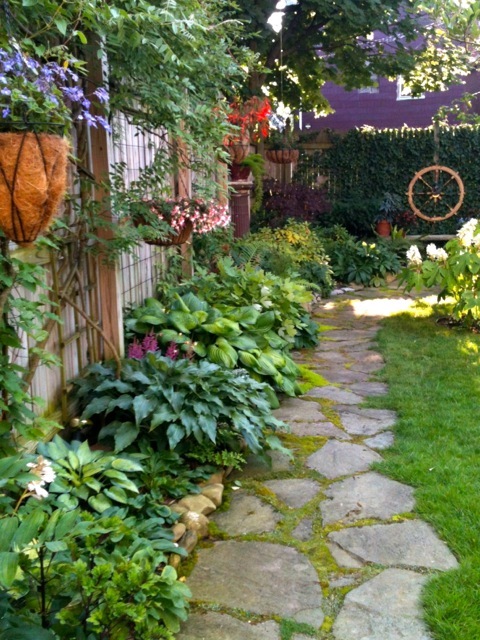 Garden Walk has been getting larger by the year - and not in just the number of gardens. 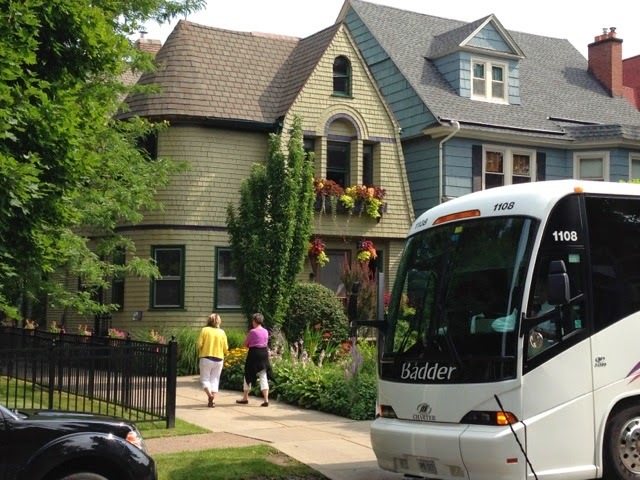 Next year it'll be even bigger, with more ancillary events as it adopts the National garden Festival - look for bus and bike tours of gardens, an annual public space makeover by area landscapers, educational events, Open gardens throughout the Buffalo Niagara on Thursdays and Fridays, and a garden art sale! Thanks for the FB links to this page Dan. It was good to meet you and Carolann, ever so briefly, during the Walk. Glad you've become a fan of the Walk too. 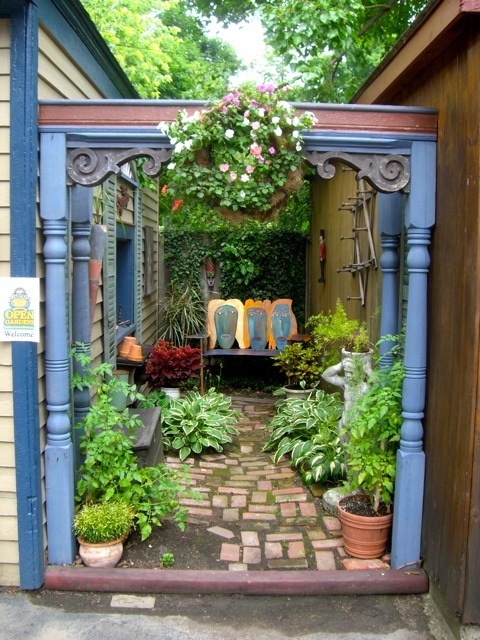 I think any fan of gardening should add a trip to Buffalo to Garden Walk to their bucket list! We;re already planning and plotting for next year's event.